Hope you all had a wonderful Memorial Day Weekend! It sure was a hot one - fitting I suppose since Memorial Day usually (unofficially) represents the beginning of summer. Let's hope the whole summer isn't that hot and humid. Today, however, is just perfect. We've been busy these last few weeks with some projects around the house and I don't know about you, but I'm always so glad when they're over. I'm glad to have things back in order, construction dust cleaned up and life back to normal - quiet and organized. Toward the end of Week Two of construction, we really needed a change of scenery so we headed out to lunch at our favorite neighborhood gathering place - the Vischer Ferry General Store! You're probably familiar with it, since I've blogged about it a couple of times before, but I'm telling you - this place never gets old. The General Store is the perfect place to enjoy great food, in a quiet and friendly atmosphere in the company of local neighbors. Whether you've visited last month or last week, visitors are always greeted with a warm welcome. Unlike the fast-paced chain restaurants, at the General Store there are only a handful of people behind the counter - faces that become familiar friends with each visit. You won't be handed a menu with endless options. Instead you'll choose from a short list on a chalkboard of today's options......a soup or two, quiche, a salad of the day and a few sandwich options. The food is prepared fresh from fresh ingredients and delivered to your table. If you're like us, while you wait to place your order you probably take a long and longing look at the baked goods of the day - mostly all made by Anouk that day. This is one time willpower and discipline should be ignored. Anything you consume is well worth the calories. Photo from a previous visit. I knew before arriving that I wanted Anouk's famous egg sandwich. John opted for the turkey, brie and apple sandwich. Both were amaaazing! I could only eat half of mine. John valiantly polished off all of his and the other half of mine. What I love is that each day the Day's Specials are posted on Facebook so I knew before going that macaroons were among the day's baked offerings. When we arrived there were only 3 left, so I was sure to order two when I ordered our sandwiches. The thing about a small neighborhood restaurant - once it's gone, it's gone. Anouk is too busy making sandwiches to do more baking throughout the day. Lesson of the Day: If you see a favorite posted on Facebook in the morning, don't wait till 2:00 to go! There might not be any left by then. I opted for the Iced Coffee with Lavender Honey and John had the Fresh Squeezed Lemonade, both delicious and refreshing. "We will have a fruit salad today with grapes, mango, kiwi, orange and a little bit of ginger syrup. Pair it with one of our baked goods, an egg sandwich or a piece of quiche for a great start of your day. Our soup will be chicken curry or red lentil. Our baked, gluten free doughnut is maple syrup flavored. We will also have a Dutch breakfast cake (ontbijtkoek) raspberry lime vegan muffin, banana bread, chocolate chip cookies, brownies, meringues and lemon tea cakes besides our sandwiches and quiches. The salad will be an Italian garden salad topped with cheese or almonds or a Jerusalem couscous salad topped with avocado." And another day: Today's soup is black bean and two kinds of quiche: Caramelized onion goat cheese and Alsacienne with cheddar, gruyere, and bacon. We have two salads today. The first is a gluten-free quinoa salad with cucumbers, red onions, cilantro, and walnut dressing, topped with goat cheese. We also have a farro salad with bell peppers, onions, asparagus, and thyme dressing, topped with avocados. Baked goods include our marzipan cake, scones, Dutch Boterkoek, apple muffins (V), coconut macaroons (GF), and chocolate chip cookies. Sound good? Check their Facebook page for daily specials and hours (link provided below). Aside from the delicious food and hospitality, the Vischer Ferry General Store is full of unique and beautiful merchandise, often from local artisans. I decided during this visit that if I were stranded on a desert island, I'd be just fine as long as I had a supply of Anouk's coconut macaroons! If you love macaroons.....you have to try these! On my previous visit to the General Store, I purchased the birdhouse above (the green one with the ladybug and daisies). Well.....my birds loved it.....although how they used it was a little different from the creators idea. Piece by piece, bit by bit, the birds have plucked the fiber for their nests until now all that remains is the front of the wall of the house! 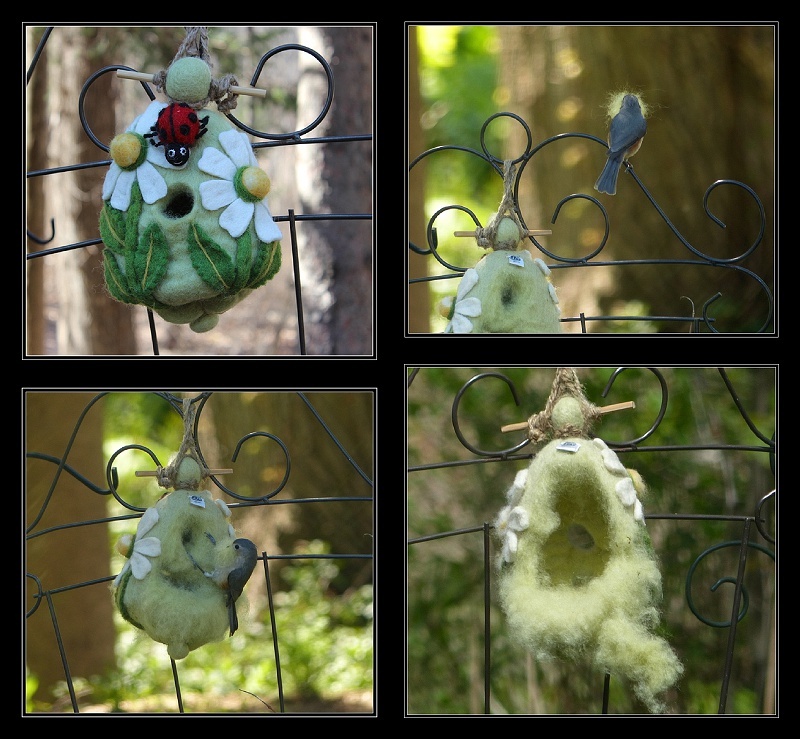 I'd love to see all the cozy nests lined with green fiber that my backyard baby birds are enjoying this spring! If you haven't gotten there yet, make it a point to visit the Vischer Ferry General Store. The store is open Wednesday-Sunday, 8:00-3:00. Visit soon and tell them I sent you! Expectation - The Eighth Deadly Sin.